Our range of products include pvc strip dividers. 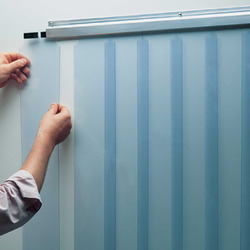 The range of products offered by us comprises of premium quality PVC Strip Dividers. These dividers are manufactured at our spacious infrastructure facility by using premium quality PVC as the raw material. These strip dividers are easy to install and require negligible maintenance. These dividers are available to clients at economical prices in different specifications. Looking for PVC Strip Dividers ?